Monday mornings can be a drag, but saving cash is always a nice pick-me-up. 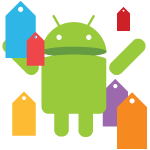 We care deeply about your happiness, so we keep careful watch over the Android app ecosystem to let you know when the deals pop up. So let's get to it.